For people who run events. We understand running major events involves juggling complex, dynamic environments along with managing a diverse workforce and the public in mass. Inadequate technologies haven’t succeeded in meeting these challenges. Until now. 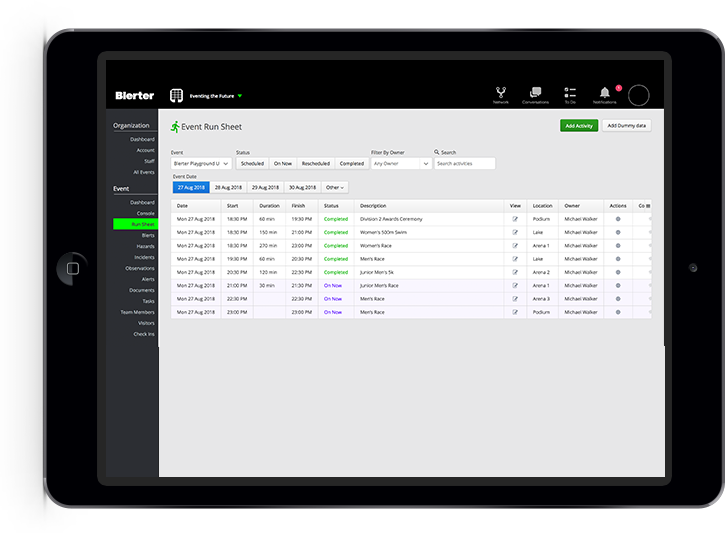 With Blerter, you can reduce your response time to operational issues, by deploying resources faster, reacting to situations as they arise and keeping your events team informed. A powerful, simple-to-use, operations platform for the smooth delivery of complex events. Centrally controlled, with across-the-board visibility, so all your staff and volunteers are aligned. Breathe easy when things happen out of your control that impact the schedule; the run sheet can be accessed and updated in real-time. Have the power to push out update notifications as and when your event evolves. You can inform everyone without hesitation, no matter what’s thrown your way. The operations platform you’ve always dreamed of. Have access to everything in real-time to smoothly manage the running of your event. It provides visibility of who’s checked-in to your event, the majority of event data all on one screen, and the flow of communication across your staff and volunteers. No incident goes unresolved. The Blerter workflow is managed through the console. Review new incidents, assign tasks, and follow their progress to resolution. Access your logs, tasks and incident timelines at anytime. Helping you to continually improve your processes. Meet your new incident management process. Record all incidents in one, accessible place. Breathe easy when things happen unexpectedly that impact the schedule; the run sheet can be accessed and updated in real-time. Have the power to automate update notifications as your event evolves. You can inform everyone without hesitation, no matter what’s thrown your way. 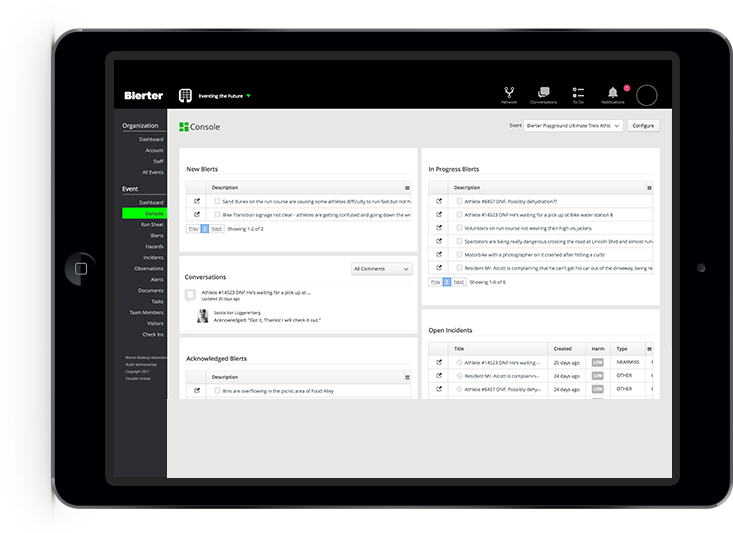 The best thing about Blerter is its ability to crowdsource information that we wouldn’t otherwise have access to... all that information in one spot, that’s recorded, and we can refer back to, is really, really powerful for us.